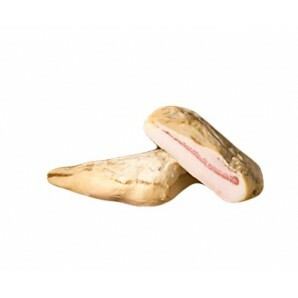 Iberian Pork Jowl - Papada Ibérica There is 1 product. The Iberian Pok Jowl - Papada Ibérica - is a type of sausage where fat is predominant. It is quite tender and juicy meat. Although sometimes confused with bacon, this is even juicier . This meat is obtained from the top of the foot , near the throat . Usually it appears in small thin strips and is ideal for barbecues or accompanying it with vegetables. Iberian Acorn Cured Pork Jowl Hermanos Contreras Provenance: Dehesa de Extremadura. Weight: 2.20 lbs (1 kg) The Pork Jowl is more greasy meat that you can get the pork. You remove it from the lower part of the pig's head. Once cured and salt you can use to do the same to the bacon.